Prepare for the oncoming adventurers with this watch born from Breitling's partnership with the RAF and producing this special edition of the Colt series. A highly accessible watch, with COSC chronometer certification, styled almost completely in black with a rubber strap for easier wearing. Red accents line the dial that give it a more classier feel, with the RAF logo at the 9 o'clock mark to signify its status as a limited edition piece. Specialists in technical timepieces Breitling originally designed certified chronometers primarily for aviation. Breitling Colt Limited RAF Edition Men's Black Strap Watch is rated 5.0 out of 5 by 1. Rated 5 out of 5 by Anonymous from A quality watch I am so pleased I bought this watch. Being a limited edition of only 100 makes it even more special. . 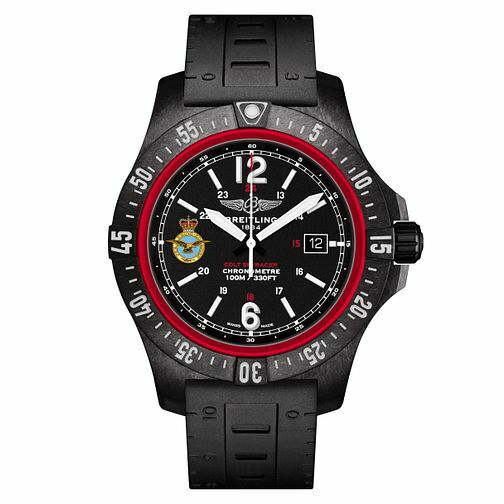 This Breitling watch is a great partner to commemorate 100 years of the RAF.